Address: Army Medical College, Abid Majeed Road, Rawalpindi. 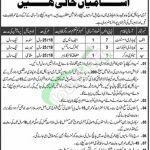 Here 02nd August we provide you AMC Jobs 2018 | Army Medical College Rawalpindi Jobs 2018 Advertisement Latest Vacancies. Latest job opportunities are available in Army Medical College Abid Majeed Road, Rawalpindi which is working under the rules of Pakistan Army. As most of us desire to have job in Pakistan Army or Army related department and those who are unable to join Pakistan Army due to physical fitness OR age issues and they move towards different departments and institutions which are working under Pak Army and the basic purpose of their attraction towards this defence force is this that recruitment is done in it on purely merit basis and capabilities of applicant. So, viewers take advantage of this opportunity and apply as soon as possible against the following positions such as (Laboratory Assistant, Laboratory Attendant, Sanitary Worker). AMC Rawalpindi invites applications from the Sindh, local domiciled candidates who possess following requirements such as FSc / Matric / Middle pass candidates having relevant field experience are eligible to apply. So, those candidates who fulfill the criteria may apply as per the following how to apply procedure given in the following heading. The application written on a plain paper along with attested copies of educational certificate, experience certificate, CNIC, domicile and recent photographs on the following address given below. Candidates have to attach to the application a paid postal order of Rs. 200/- in favor of Principal Army Medical College Rawalpindi. Only shortlisted candidates will be invited for test/interviews. No TA/DA will be paid for the purpose of test/interviews.